Handmade popiah, originally uploaded by Camemberu. 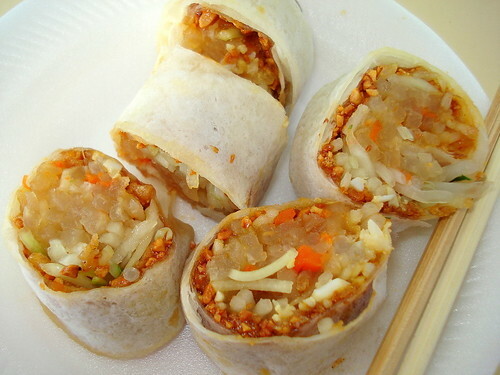 Popiah or springroll is a wonderful little snack. This is the original healthy wrap! But most places make only mediocre popiah. I saw this stall at Marine Parade central food centre selling mainly only popiah and kueh pie tee (which has the same turnip-based filling but in a little fried flour cup). Well, it's been a few months and the stall hasn't collapsed yet, so I thought I'd give it a try. The popiah (S$1.20) came really small and didn't look too impressive. But I was pleasantly surprised by the taste - a right balance of sweet and savoury with a hint of spicy (if you ask for chili). Best of all - it's got crunch! I did notice the lady sprinkling on a generous amount of crushed peanuts and the crispy flour bits (never really found out what this is). I love it when there's a good crunchy bite. The skin was also good - not too soft or chewy, and held its own without the sauces soaking through. My only quibble is that it's too small a serving! Homemade Springroll stall at Marine Parade Central Food Centre, originally uploaded by Camemberu. The stall also sells jiu her eng chye (cuttlefish kangkong/convolvulus leaves) at S$1.80 and kueh pie tee for S$3. Popiah sets, popiah skin and kueh pie tee sets also available for parties and if you want to roll/make your own at home. Yes, Julia, I saw some others too! Looks like they're either a chain or fast becoming one!